Oh, do we have a doozy for you! 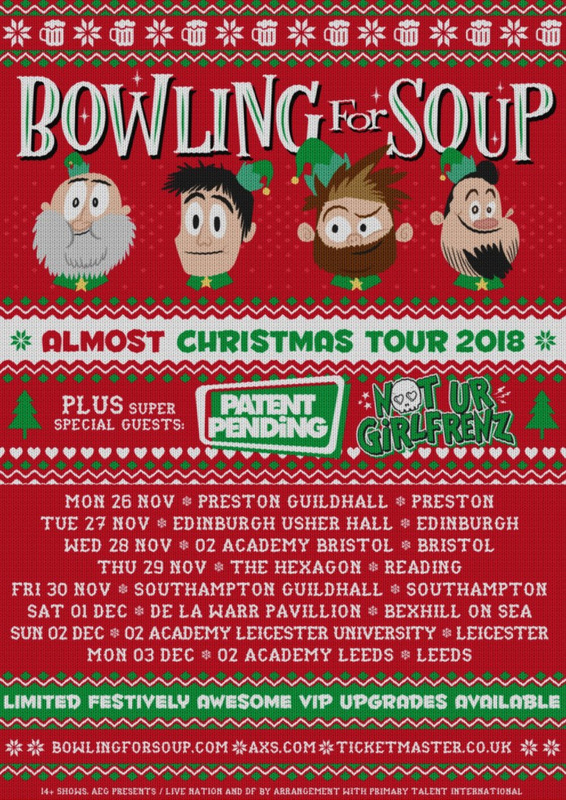 Up for grabs are two tickets – VIP no less – for The Bowling For Soup gig on Tuesday 27th November (next week) in Edinburgh. While VIP tickets are usually upgrades to an existing ticket, these ones include entry to the gig. In other words, it’s the full package. After this, they can grab a spot by the barrier before everyone else is allowed in for the main show. Which, don’t forget, also includes performances from Not Ur Girlfrenz and Patent Pending. Definitely a great night’s entertainment! So, how do you get your paws on these tickets? Simply send your answer to the question below, and your full name, to [competition closed]. The competition will close at midday on Friday 23rd to ensure that we have time to notify winners so get in there quick! PLEASE NOTE that if you get an email back warning that your message has been classed as spam, we will dig it out of our spam queue and enter it. Our system seems to be being a bit sensitive at the moment! You don’t need to re-send. A couple of years back, Bowling For Soup released an acoustic album. It was recorded in a freakin’… what? Entrants must be 18 or over due to venue restrictions. We’ll need your real name to put on the guest list should you win. At lunchtime on Friday 23rd November 2018, we’ll pick one winner randomly from the correct answers. We may use dice, pluck names from a hat or chuck darts at a list. I don’t know yet. But it will be random and fair. Your details (name / email) will be passed on to the promoter (Rage PR) purely for the purpose of arranging your prize and for no other purpose. Editor’s decision is final. Prize consists of the pair of tickets/names on the guestlist. No cash alternative. Why do they always say that in rules? If you want to win money you’d buy a lottery ticket. Duh.